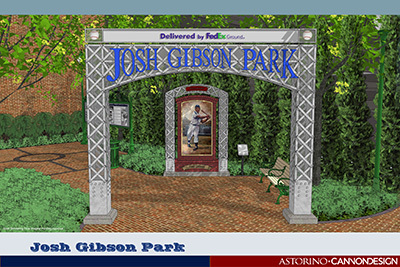 After receiving a large donation from a new corporate sponsor, the Josh Gibson Foundation plans to break ground on Josh Gibson Heritage Park next year in Station Square. The foundation announced that FedEx Ground donated $500,000 toward construction of the outdoor space, becoming its title sponsor. After receiving land for the park from Forest City Commercial Group, in February, the foundation announced intentions to begin planning the park. The target date for the park to open is spring 2017 and it will be free to the public.